There is something so optimistic about a new journal, all those blank pages just waiting to filled with ideas, observations, sketches. I love starting out the new year with a fresh book, and this year I turned to Maine-based Boarding School & Woodcraft for my paper fix. Run by brother-and-sister team Ashley and Erik Flanagan, Boarding School creates wood hand-bound journals and albums, plus cutting board, furniture and other home goods out of their shop housed in the State Theater in Portland. 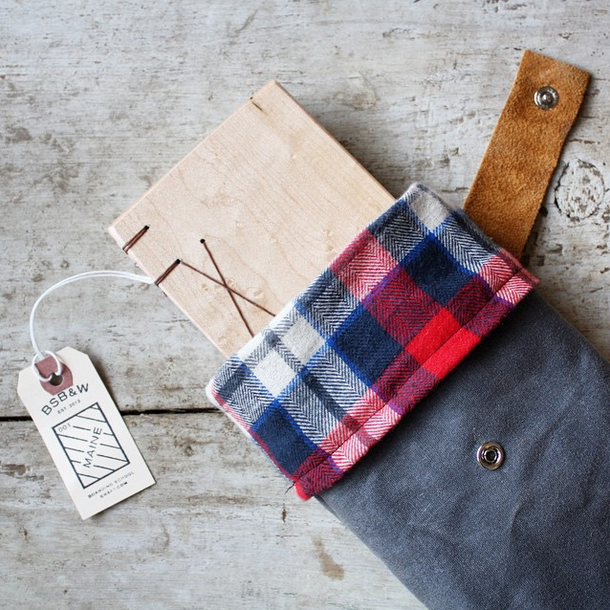 One of my favorite products of theirs is the waxed canvas bag and field journal (above), a gorgeous gift for bird-watchers, travelers, or really anyone who loves making a good list. Here are a few more of their products below, and be sure to head to their Tumblr page for a peek into their workshop and process.